Carly Pearce "Every Little Thing"
The hotly anticipated debut release from Carly Pearce, Every Little Thing, was released on October 13th. Grounded by an unashamedly country-pop sound, Every Little Thing is sure to draw listeners in with it's mix of catchy instrumental lines, distinctive vocal and compelling tracks. Lead single (and title track) Every Little Thing is certainly one of the strongest songs on the album. One of only two instances on the release where we have the opportunity to hear a real vulnerability behind Carly's vocal, Every Little Thing is delivered with a sadness that, ironically, sees the strongest vocal delivery from Carly. The production is pitched at a perfect level in order to support Carly and round out the song rather than overpowering the delicacy and the piano and drum lines in particular work together really well. It is undoubtedly a brave song from a new country artist and Carly delivers it well. I Need A Ride Home is the other truly emotive moment within the release. With an emotive, homesick message behind it, the track is sure to be relatable to a lot of listeners and, whilst the lyric is ultimately a little repetitive, it doesn't seem to matter in this instance as you are swept along by the track itself. A song you can happily turn to time and time again. Even though it has a completely different feel to both of these tracks, Honeysuckle is equally as strong in it's own ways. With a solid drum beat setting the pace almost immediately, Honeysuckle conjures up echoes of Lady Antebellum's American Honey and, through this, crafts a distinctly listenable track. A song that simply urges you to turn it up and loud and sing along, I can imagine this will be very popular in live performances, with a catchy melody and unmistakably 'singable' quality. Every Little Thing is generally a very strong album however there are a couple of instances that let it down slightly. This is particularly apparent in Hide the Wine and Feel Somethin'. The main issue I found with Feel Somethin' is within the verses. The chorus itself sounds great and is full of gutsy attitude but the verses end up feeling a little stilted as there are simply too many words to try and cram in which ultimately just feels a little awkward. Hide The Wine on the other hand has tried to channel a Steampunk, work-song style which simply doesn't work. It's unfortunate that this is the opening track to the album but - certainly compared to the rest of the album - it's a little average with a slightly messy overall sound. 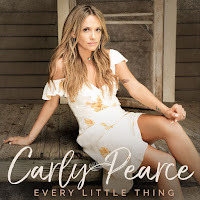 Overall Every Little Thing is undoubtedly a strong album and, whilst not perfect, is an accomplished introduction to Carly Pearce as an artist. Carly should certainly be proud of this album, it will be interesting to see her develop as an artist through future releases. Labels: Carly Pearce "Every Little Thing"